consistent, reliable quality and safe, smooth performance. From design to testing and support, partnered with the RV, Military, Cargo, Horse, Utility and Equipment Trailer industries to solve specific challenges with targeted products. We’re ready to propel your company into an ever expanding age of lighter, more fuel-efficient, automotive quality design. Our in-house laboratory performs rigorous stress, fatigue and metallurgical evaluations, while computer equipped test vehicles analyze actual product performance. Systems are documented for complete product quality and to eliminate process variations. The full complete wrapped tongue starts at the coupler and ends at the fenders on both sides of the trailer. This type of engineering ensures a smooth, consistent tow and reduces the wear and tear on the trailer framework, axles and tires. We do everything we can to produce the safest, most durable, longest lasting trailer on the road. Additional vertical uprights around the entire perimeter of the trailer unit provides additional support, durability and stability to the trailer. 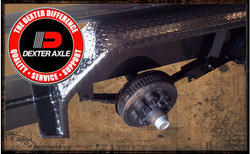 The extra supports prevent unnecessary trailer flex when hauling heavy loads and adds strength to the top rail unit. As we all know, not every load placed on the trailer rests inside the rails. We do our best to build a trailer ENGINEERED to handle the tough day to day stresses of the working world and we build it to LAST. As a means of cutting cost, many trailer manufacturers have eliminated the fender backs on many of their smaller utility trailers. At STAGECOACH, we make every effort not to cut QUALITY in an attempt to lower price. The back on a trailer fender plays an important role in protecting the tire and axle from being penetrated by items being hauled on the trailer bed. Without the fender back as a barrier, damage can be done to the load, the trailer or both. We will never ever compromise quality in an effort to increase quantity. That's just not how we do business. Across the front of a STAGECOACH Trailer you'll find this 1-1/2" x 3/16" flatbar security plate to hold your boards in place. This flatbar is screwed down and can be easily removed for trailer repair or board replacement. Trailers get used and abused as part of a work team. Repairs and board replacement are part of the job. This simple STAGECOACH design addition makes it easier to fix the discrepancy and keep right on trucking. All STAGECOACH Trailers equipped with wood floors have 2" x 8" treated lumber floors. 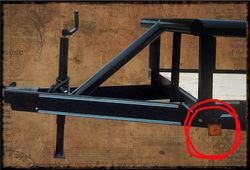 What good is it to build a superior quality trailer with premium quality parts and craftsmanship if you intend on putting sub-quality or weak lumber on the bed. We think every material we put on our trailers ought to be the best you can buy. We value our customers and the relationships we build more than anything. At STAGECOACH, we believe the BEST way to build a lasting relationship is to build a trailer that LASTS. Sometimes the tiniest change in the way a trailer is engineered can dramatically improve the overall usability of the unit. Here, at STAGECOACH Trailers, we do everything we can to ensure our customers get a trailer that works and performs as hard as you do. 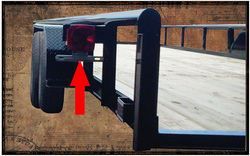 The raised LED tail light is simply a safer, better place to mount something relatively fragile on a trailer unit. It's less likely to get broken or damaged due to flying debris off the tires, or being knocked loose by other accidents. At STAGECOACH Trailers, we believe when a customer pays for a brand new trailer, every component on that trailer should be brand new! 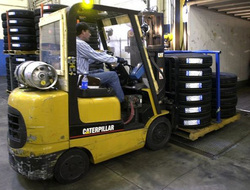 We only use premium grade tires and wheels new from the factory. On a STAGECOACH Trailer, you get what you pay for. On a STAGECOACH Trailer, it's only used after YOU use it. STAGECOACH always makes an effort to put safety first. 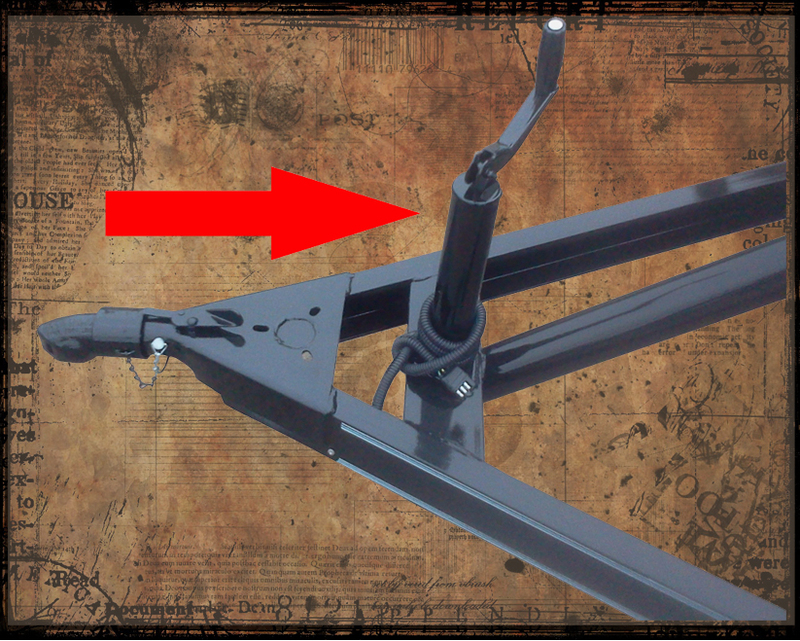 Every trailer manufactured at our facility is equipped with a "set back jack". Moving the jack back on the tongue adds measurable strength and stability to the tongue and coupler ensemble. This also ensures the operator can open and close the tailgate of a truck easily and safely without damage to the truck or the trailer. Just another small step in making sure we engineer and construct a trailer you can count on long after the cows come home. The diagonal upright from the center of the tongue to the center of the front top rail adds additional structure support and stability to the entire trailer unit. We do everything in our power to ensure a smooth, consistent haul with the least possible wear and tear on the axles, tires and framework of the trailer. The little things we do are what set us apart and make a STAGECOACH Trailer the ONLY choice for those of us who have "No Time for Down Time". This little gate latch might not look like such a big selling point, but take a closer look and you'll notice it's genius design. This latching system is self contained and not removable. There is NO PIN to keep up with or "not" keep up with. No awkward cables or noise makers. 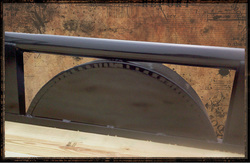 This simple design ensures your loading gate will be locked down securely with no shaking or annoying road rattle. Almost all quality improvement comes via simplification of design, manufacturing, layout, processes and procedures. We believe a product that SIMPLY works better is the BEST design choice. STAGECOACH Trailers are equipped with safety security brackets from front to back and include this accordion style plastic loom for added ease of use and safety during travel. We make every effort to ensure your STAGECOACH Trailer is the BEST, most durable, longest lasting trailer you'll ever haul. Successful engineers ask better questions and get better results. We've all seen the poorly made loading gate with the sagging angle iron and bowed expanded metal. At STAGECOACH, we know how you use your trailers and the extreme conditions where you work. Our trailer ramp gates are built with 1-1/2" x 1-1/2" square tubing for stronger more durable no sag loading and security. Our heavy duty ramp gates are built with 2" x 2" square tubing for even better weight distribution and stronger, longer lasting construction. plated shafts and fully greased pivot points deliver a trailer hoist with the power, performance and dependability you trust from Crysteel / Colt Hoist Company. The front clearance light on a STAGECOACH Trailer is carefully placed to help prevent damage to the LED lights or the trailer unit. Placing lights according to D.O.T. guidelines, only higher up on the trailer and more "out of the way" insures the lights last longer and work more efficiently for the long haul. Trailer manufacturing is an industry dominated by practices and procedures being done a certain way simply because that's the way its always been done. At STAGECOACH, we make a continuous effort to test, evaluate and implement technological advancements to improve the overall performance and durability of our trailers. In addition to making sure our welders are using correct voltage and mode of metal transfer, we also increase the integrity of the weld and the structure by using a gas mixture of 95% argon and 5% oxygen. Although the mixture costs a bit more, the weld result is hotter, with better penetration and superior consistency for a deeper, tighter, longer lasting bond. Just another small step in building the safest, most durable, best performing trailer on the road. At STAGECOACH Trailers, we know what you put your trailers through on a day to day basis. Our trailers are cleaned, primed and then painted with two coats of GCI Automotive grade paint. We only use superior performance GCI automotive grade paint on our trailers. Gillespie Coatings paint products has proven itself under the rigors of our US Armed Forces for decades and is a brand you can count on for maximum durability. Gillespie is a military specialty government supplier, not just a color specialist. GCI manufactures coatings, primers, transportation and equipment colors, industrial paints, primers and finishes, additives, solvents and thinners, applicators, accessories, and miscellaneous finishes. They also specialize in web coating services, plating, electro coating, and dipping services. When it comes to protecting your investment for years to come, we've done our homework and chosen the best and most reputable company for the job. You can count on GCI to protect your equipment from everything you put it through year after year.